WHALES: Killer Whales in the North Atlantic ... Have you seen one yet? 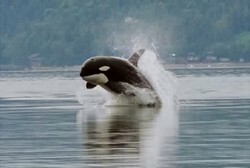 Most of us know that Killer Whales or Orcas are common in the Pacific. But did you know they occur along the Atlantic coast of the United States and Canada? While the East Coast population of Killer Whales is small to be sure, they do move widely along the coast of the United States and Canada. And when they show up in local waters they cause considerable excitement .. particularly among the whale watching companies and those of us who have a special affection for marine mammals. Certainly, very few of us have had the privilege of seeing east coast Orcas, but if they come to your area, make an effort to get out on the water for a once-in-a-lifetime experience. I guarantee that you won't regret it. INTRODUCTION: Once feared by man, killer whales have been intensively studied and, while experts recommend caution in dealing with any large marine mammal, they appear to tolerate curious humans and their boats. In recent years, killer whales have been held in captivity for research and display purposes and this practice has lead to considerable debate and conflict. Nevertheless, these whales have entertained and fascinated hundreds of thousands of visitors and have raised interest and concern regarding the conservation of whales and other species, as well as the environmental health of the ocean. Seafarers and whalers once referred to killer whales as “wolves of the sea”. Indeed, these large, swift whales are so intelligent that they may well be the ultimate ocean predator. Working in co-operative packs or pods, they hunt seals, porpoise and even large baleen whales. The literature contains many thrilling accounts of attacks, including one in which a killer whale attacked a large bowhead and “…clung with the tenacity of a bull-dog to his mouth, and gradually caused him to bleed to death.” They eat almost anything that swims … fish, squid, seals, ducks, turtles, porpoise and whales. Killer Whales form strong social bonds and family group structures. Pods even have their own dialect which is so distinct that some researchers can recognize specific groups by their characteristic sounds. RANGE: Killers occur in the Atlantic, Pacific and Arctic Oceans. They are commonly encountered along the Pacific coast of North America, particularly in places like the Strait of Juan de Fuca where the geography of the area brings them in close contact with man. They are not commonly seen along the Atlantic coast. The gray area in the map shows the North American distribution. STATUS: The killer whale is an important totem in west coast Indian societies and has appeared in their art for centuries. It was never a serious object of the whalers. However, it was considered to be a competitor to the west coast fur seal industry at the turn of the century and was probably killed whenever possible. OTHER NAMES: Orca, killer, blackfish, grampus, épaulard. greyish “saddle patch” occurs behind the dorsal fin. They have 10 to 13 pairs of large teeth. REFERENCES- The following references will help you learn more about Orca the Killer Whale. Banfield, A.W.F. The Mammals of Canada. University of Toronto Press, Toronto, 1974. Cousteau, J-Y. and P. Diolé The Whale, Mighty Monarch of the Sea. Doubleday & Company, Inc., New York, 1972. Ellis R. The Book of Whales. Alfred A. Knopf, Inc., 1982. Hoyt, Eric The Whale Watchers Handbook. Doubleday & Company, New York, 1984. Hoyt, Eric The Whales Called “Killer”. National Geogaphic Magazine. Vol. 166, No.2 pp. 220, 1984. Katona, S., D. Richardson and R. Hazard A Field Guide to the Whales & Seals of the Gulf of Maine. 1975. Nelson, E.W. Wild Animals of North America. National Geographic Magazine. Early publication, circa 1920. Pike, G.C. and I.B. MacAskie Marine Mammals of British Columbia. Fish. Res. Bd. Canada Bull. 171:19-23, 1969. Scammon, C.M. The Marine Mammals of the North-western Coast of North America. Dover Publications, Inc., New York, reprint, 1968. Stonehouse, Bernard. Sea Mammals of the World. Penquin Books, 1985. I have never seen a killer whale and do not approve f their being captured and displayed in aquaria. They are amazing and belong to a species that deserve respect. I sincerely hope mankind would stop interfering with the ocean's ecosystem. I am not a fan of capturing them and displaying them to an audience. Orca whales are also known as Killer whales and sometimes called Blackfish. They are the largest species of dolphin and are fast swimmers reaching speeds of 55 km per hour. Whales don’t have gills that allow them to breathe underwater, so how do they sleep?